Thailand, Germany, and Australia are a few places that I have been but I knew the next adventure in my life would be somewhere in South America. I had a couple cities in mind but it only took me five minutes before I knew where I wanted to live. 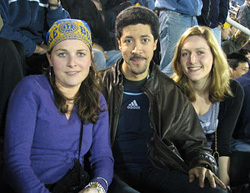 The culture and lifestyle of Buenos Aires was enticing and lured me in quickly. Some alluring aspects to Argentina were the mix of European and Latin American culture, together with the much-raved about aspects of the city itself (not to mention the rumors about how attractive the Argentine women were!). After lots of research, I decided to take Spanish lessons with Apple Languages at their Plaza de Mayo school in the centre of Buenos Aires. My first day was like starting high school all over again. I was meeting so many people that I couldn’t remember all of their names. Everyone was in the same situation as myself; excited to be in Buenos Aires and experiencing something new. After my four weeks stay in Buenos Aires, I chose to change place and see something different about Argentina. 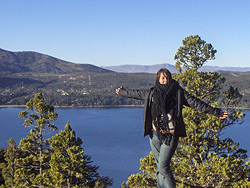 I didn’t really know Bariloche before, but I heard that it’s a great place for outdoor activities. I arrived there by bus and already on the way I was impressed of the landscape! I knew immediately that it is the right place to be for the next couple of weeks! So I attended another 4 weeks of Spanish lessons there. When I was planning my gap year, I immediately decided to include Latin America. As I am half way through a Spanish language degree at university, I thought it made good sense to not only do a Spanish course in Spain, but also learn some Latin American Spanish – different accent, different sights – I couldn’t wait! I flew to Buenos Aires, spent a few days sightseeing, and then travelled overland to Bariloche. It was a REALLY long coach trip, but I loved it – watching the countryside go by, chatting to people on the coach… and then I saw Bariloche appearing on the horizon, and my excitement grew! First I wanted to study Spanish in Spain. Then suddenly I thought why not making an experience a bit further away? So changed my mind and went to Buenos Aires. There I took a Spanish course for 4 weeks. I didn’t speak a word when I arrived. I had some basics, but that was all. I chose to live in a host family; there you have the possibility to speak the language the most. And it was just perfect! I had a lovely host mum and she really took care in speaking a lot with me. She was like my second family. Hi, my name is Mario, from Switzerland. 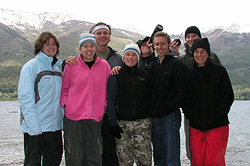 I was to the school in Bariloche from May 14th until June 6th 2008. 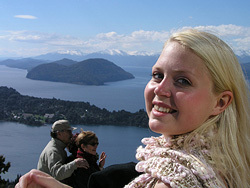 I chose this language school because I wanted to study Spanish in a small city in Argentina. I didn’t know anybody before the moment I began my studies. My first impression of the school was very positive. When I arrived at the school on Monday, everything was very organized. I did a placement test and started soon at the level: Principiante 1B (beginners 1B). Lessons started on time as usual. Teachers were very kind, competent and well prepared. The teachers normally spoke Spanish in class, but it was also very useful the fact that teachers could in fact speak other languages, enabling them to explain and understand some grammar aspects by establishing comparison among languages. Thanks to the flexibility of the professors and administration I was able to sit for an exam every week and to get an advanced level in only eight weeks. I studied Spanish only in High School, but not since then. So I thought it would be a great idea to take Spanish classes in South America. 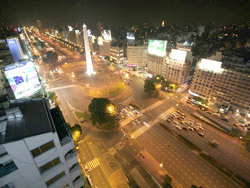 I decided to go to Argentina, because I wanted to experience the people and culture of Argentina. I was a bit nervous and very excited, curious about the people and culture. I knew all of the stereotypes – Tango, soccer and meat eating. I have eaten a lot of meat, watched several Boca, River and Superclasico ‘futbol’ matches and have combined my Spanish course with Tango classes! In fact I spent one of my first afternoons in a Tango class organized by the school, dancing Tango with another student from the school. I was a bit unaccustomed to dancing so close and intimately, but it was funny, and obviously no problem once you got used to it! It’s like being at home – but 100 times more fun!! I’ve been studying Spanish in Bariloche and Santiago de Chile for the past couple of months and am really loving it! I had already been at the Santiago school for about a month and because I really liked it there, I decided to try out the school in Bariloche too. My expectations of the school and of Bariloche itself were pretty high, as I had heard so many great things about it, and well, both the school and Bariloche have exceeded those expectations! First of all, the city is beautiful, the views from the tops of the numerous mountains and the sun setting over the lakes are images that I will never forget. Hi!.. In the beginning of January I decided to come down to South America to learn Spanish. I didn’t know which country.. I was looking for a place where I will would feel comfortable and where it would be easy to meet people and with lots to see and do… So, I booked a flight and in a couple of weeks I was in Argentina! I’ve now been at the school for 9 weeks and it’s been simply great! 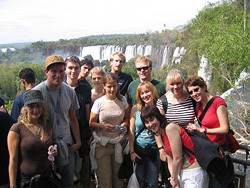 The second week I was here, lots of us went to Iguazu Falls on a trip organized by the school. It was an amazing trip and the waterfalls were like nothing I had ever seen before!… right in the middle of a jungle and a really incredible sight. I arrived to Buenos Aires 6 weeks ago, after a long journey from Japan, and when I got off the plane the only thing I could think was: I don’t know a word of Spanish!! Luckily, I started my Spanish lessons that same Monday! At the beginning, I took group lessons, but I liked it so much that I decided to take additional individual lessons, plus volunteer work (arranged for me by the school). It was simply amazing how quickly I learnt the language! At first, of course, I wasn’t able to understand a single word in Spanish but then bit by bit I started to understand more and more! It quickly became real fun to communicate with the locals, even with people who I’d never seen or talked to before! 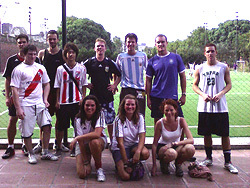 Argentinean people are really friendly, easygoing and always willing to give you a hand. 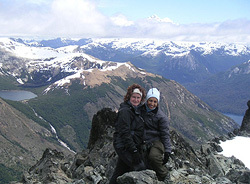 Wild adventure in Cordoba, Argentina! Cordoba is just a beautiful colonial-style historic Argentinean city. There’s always so much to see and do here! For example, if you are seeking extreme adventure and high adrenaline thrills, then don’t miss The Rally in Argentina in late March. Come to Cordoba hills and enjoy 3 days of intense car races around winding mountain paths! It’s amazing! 2008 will be the 28th running of the Rally in Argentina and as always the most renowned car manufacturers and world-famous rally drivers will be challenging each other along the winding dusty roads. Citröen, Ford, Subaru and Suzuki will show off their best weapons as the Rally in Argentina continues throughout the days. As a visitor, you will have the chance to witness the race just from a half meter distance and watch all the cars coming and going at an incredible high speed right in front of you!